Inside: Dying Easter eggs with rice for vibrant, mess-free egg coloring. 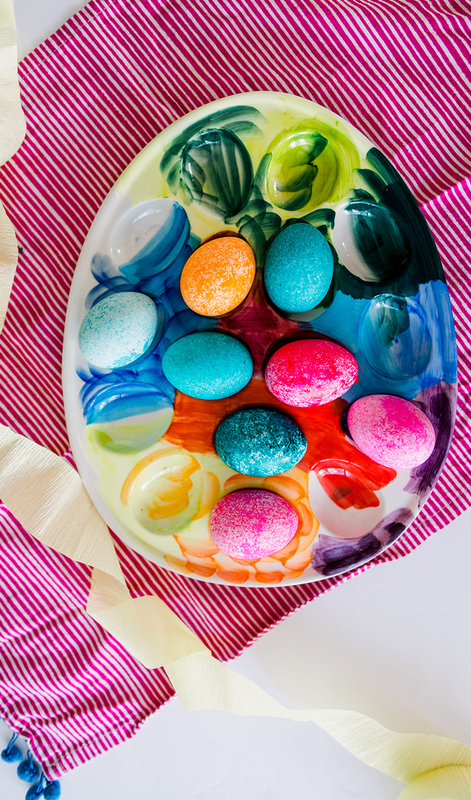 It’s Easter egg dying time and what a better way to jump into the fun than trying your hand at an entirely new way to color your eggs. We tried dying Easter eggs with rice this year and the results are 100% my favorite. A new way of coloring eggs that we will be using from here on out. One of the things my kids love the most about dying eggs is seeing cool textures and designs on the eggs. And creating piñata easter eggs worthy of all the texture awards. 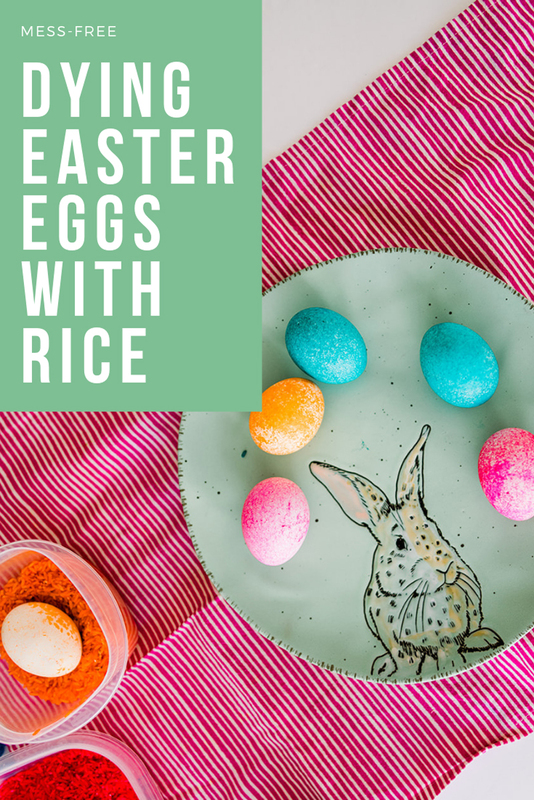 Although all of these ideas are great in and of themselves… dying Easter eggs with rice makes for an egg texture like we’ve never seen before. It honestly looks almost like glitter and is just gorgeous to create. I have never met a colored Easter egg I love this much! I love when dying our eggs is done without a giant disaster of a mess with food coloring everywhere. 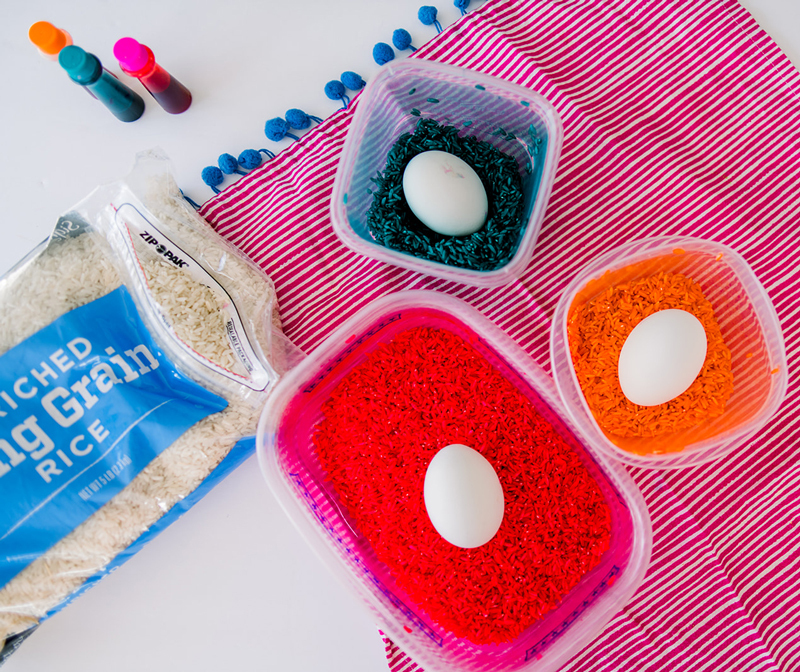 Luckily for me, dying these Easter eggs in rice means that they are submerged inside Tupperware, which keeps the surface, the kids hands, and even the floor basically mess free. 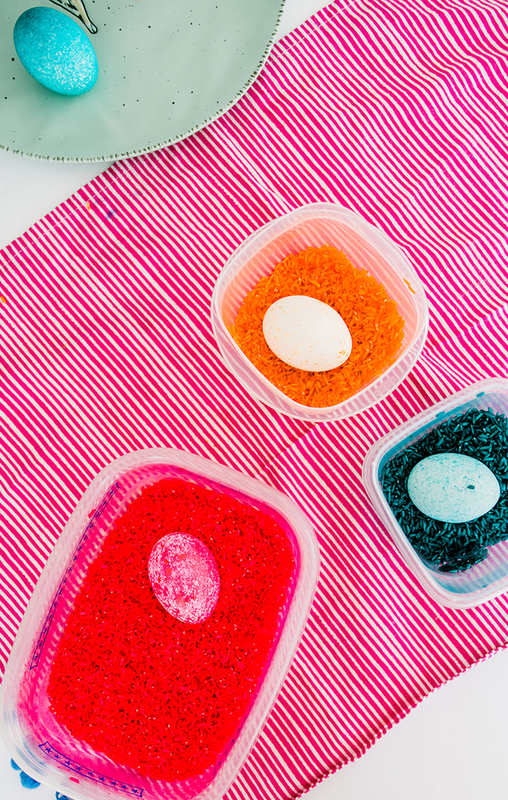 If you have small kids that will be dying eggs this year – you can do all the prep work getting the rice ready beforehand, and they can create pretty colored eggs without ever picking up the paint! That’s a win win for everyone involved! 1. Place a cup or so of rice in each of the Tupperware containers. 2. Squirt food coloring directly onto the rice (start with 6-10 drops), the more color you add the more saturated the rice and the eggs will be. 3. Place the lid on and shake vigorously until the rice is completely covered in the hue. 3. Place an egg inside the Tupperware and cover with lid. Shake gently until the egg is covered by the rice. It goes pretty quickly and honestly I was surprised with how hard we shook the Easter eggs that they didn’t break at all. So don’t be scared to shake it up! 4. Once the egg is covered in rice and appropriately dyed to your liking – carefully remove from the container and allow to dry before handling. Voila! 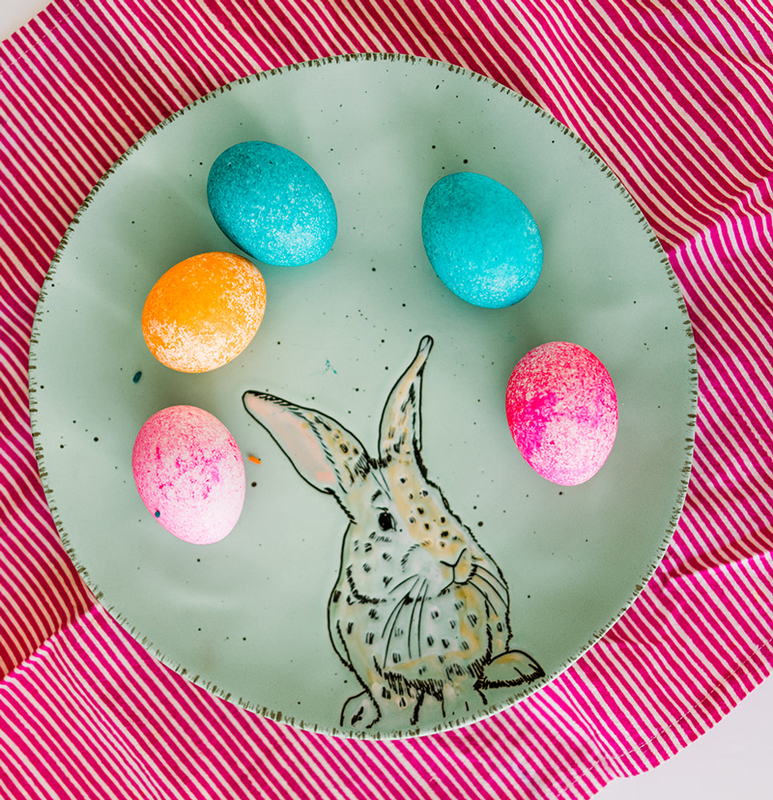 Easter eggs that look as glittery and fun as any of our messy dyed types. 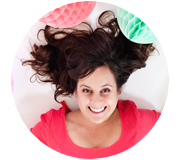 Want to know what to add to get your eggs looking even more vibrant? Here’s my secret trick for the most colorful Easter eggs around. And a list of our favorite Easter egg crafts from the past 10 years! (Photography ©A Subtle Revelry by Alyssa Lynne Photography).